You have added Just A Formality Embellished Pink Strapless Chiffon Dress into shopping cart. Rhinestones and pearls-what more can a girl ask for?? This strapless dress has gorgeous rhinestone and pearl beading in a unique pattern. The Just A Formality Embellished Pink Strapless Chiffon Dress is fully lined. It has a sweetheart neckline with a V shaped dip with added boning for structure. The bust is padded for extra support. It is a flowy chiffon material and is completed by a hidden back zipper. This dress is perfect for any formal event! 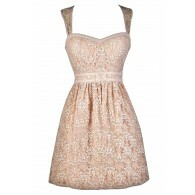 You will dazzle at any event in this gorgeous embellished dress! Pair with strappy heels and rhinestone or pearl jewelry. Details: Fully lined. Padded bust. Hidden back zipper. 100% polyester. Lining: 95% polyester, 5% spandex. Dry clean only. Small measurements: top of bust to hemline: 27.5”. Bust: 32”. You have added Just A Formality Embellished Pink Strapless Chiffon Dress into Wishlist. You have added Just A Formality Embellished Pink Strapless Chiffon Dress for Stock Notification. You have set Just A Formality Embellished Pink Strapless Chiffon Dress as a loved product. You have removed Just A Formality Embellished Pink Strapless Chiffon Dress as a loved product.